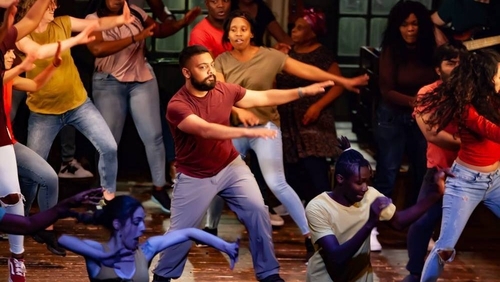 Opinion: Actor and theatremaker Donal O'Kelly, currently appearing in Jimmy's Hall at the Abbey Theatre, writes for Culture about a unique and urgent theatrical event that showcased the plight of those in Direct Provision today. On Monday morning last, 27th August, at 3pm Vicky Khokhar from Pakistan danced on the stage of the Abbey Theatre in Jimmy’s Hall Today, an assembly to examine the practice of deportations ongoing in Ireland at present. At 10pm, he boarded a flight to comply with a Deportation Order he’d been served, and that he’d appealed. Next morning, a letter from the Department of Justice arrived in the Direct Provision centre in Longford where he lived for the past three years. It said his case would be reconsidered and he would hear back from the Repatriation Office by 21st September. He got news of the letter in Pakistan on Tuesday night. The letter was dated the previous Friday 24th August. The civil servant who wrote it must have or should have had the information that Vicky had to leave the state by Monday 27th August or be subject to the deportation order, which would ban him from returning to Ireland for 10 years. The letter didn’t state that his deportation order would be lifted pending the outcome of the review. So even if Vicky had received it before he got on the flight, he still would not have been sure whether he was entitled to stay, an awful predicament in which to find oneself. To stay silent while cruelty is inflicted on so many in such a casual officious manner reduces all of us. It reduces our level of humanity. On Monday, Vicky sat on the stage of the National Theatre with the twenty-three other dancers of Catherine Young’s African-Dabke-Irish dance piece It Takes A Village, surrounded by leading lights of Dublin’s theatre community including Stephen Rea, Abbey artistic directors Graham McLaren and Neil Murray, Fishamble artistic director Jim Culleton and the cast of Jimmy’s Hall, listening to Ireland’s First Lady Sabina Higgins read from Edna O’Brien’s novel The Little Red Chairs. He was coaxed to join in the Jimmy’s Hall-type discussion, and say a few words. He spoke with a calm resigned benevolence about Ireland, expressed the hope that he would see us again, and his last words were: "I want you to promise me you will help these others so what is happening to me doesn't happen to them". He looked around at the other dancers, many in tears. Indeed, most of the gathering was in tears, a mixture of sadness, futility, anger and commitment to resist. The dysfunction that exists within the entire system of Department of Justice administration for international protection applicants has existed for three decades. It doesn't work. It’s not accidental. It’s part of the 'pull-factor deterrent' policy that has driven Ireland’s asylum-seeker procedures through a generation of senior civil servants and a dozen Ministers for Justice since the EU Dublin Convention of 1990. Charles Haughey’s and Ray Burke’s fingerprints are all over the sly culture of punitive deceit that runs through the department’s agencies - the IPO International Protection Office, INIS Irish Naturalisation and Immigration Service, GNIB Garda National Immigration Bureau and RIA Reception and Integration Agency - with some honourable exceptions. The dysfunction that exists within the entire system of Department of Justice administration for international protection applicants has existed for three decades. It doesn't work. It’s not accidental. It will continue to fail to work unless the demand for change becomes overwhelming. To stay silent while cruelty is inflicted on so many in such a casual officious manner reduces all of us. It reduces our level of humanity. If we don't resist it, we become part of the silent compliance that facilitates the dysfunction continuing. Let's be honest and own up to the continual dysfunction of our international protection application procedures - and fix them so human rights are respected, and not treated as an unfortunate prickly obstruction to quick deportation. There will be a second Jimmy’s Hall Today assembly in the Town Hall Theatre, Galway on Thursday 13th September, after the performance of Jimmy’s Hall. In the light of the death of trans woman Sylva in a Galway Direct Provision a month ago, and the deportation of Vahram Artunyan to Armenia, leaving his partner Viktoria and three-year-old daughter distraught, it’s appropriate such an assembly should take place in Galway during the run of Jimmy’s Hall in the Town Hall Theatre, the story of the wrongful deportation of Irishman Jimmy Gralton as 'an undesirable alien' in 1933. Jimmy's Hall is at the Abbey Theatre, Dublin, until September, before touring to Galway and Cork - more details here.